What's so happy about a Monday you ask? How about another Clemson win, a stellar display of talent on Saturday from our second string football players, and a giveaway from Queen of the Tailgate! Queen of the Tailgate is one of our fave go-to boutiques for gameday fashion. 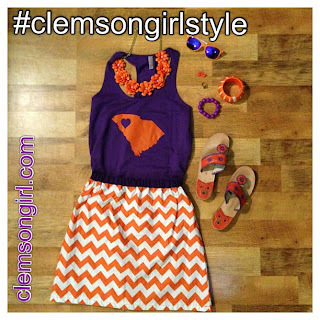 This Clemson alum owned online boutique always has the best selection of all things orange and purple. Remember this adorable purple Clemson tank from our #clemsongirlstyle contest promo? You ladies were loving it! 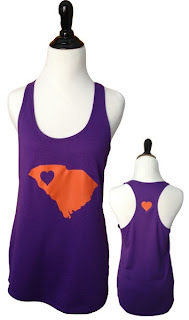 Well, Queen of the Tailgate has generously offered to help us celebrate another Clemson Tigers win with a giveaway of this super cute tank! 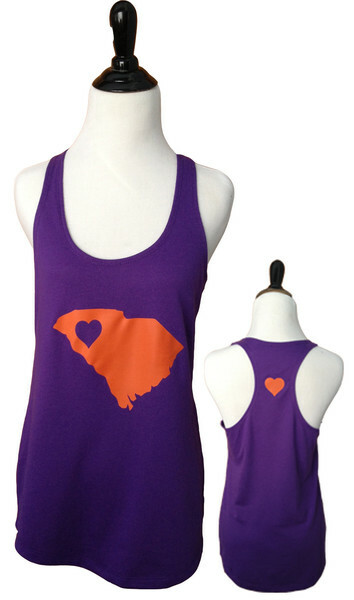 One lucky Clemson Girl will win this tank in a size of her choice! Deadline for all entries is Midnight EST, Tuesday, Sept. 10. A winner will be drawn at random and contacted by email. The winner has 48 hours to respond or we will draw a new winner. Special thanks to Queen of the Tailgate for celebrating with us! Not a bad way to start the week, right? I'm taking a break from football this weekend. Going to enjoy what's supposed to be a great weekend! I'll be traveling, so I will be listening to all the games on the radio and attending a home football game for my university in Georgia. I'll be watching the usc game with my gamecock lovin' husband. Boo! I'm sure I'll be watching lots of games, but definitely SC to see how they react from their loss to UGA. Bama vs. Texas A&M of course! Always watching football!! There are only so many weeks to get it in so I soak it up! Not as fun as watching my fav boys play!! BAMA vs Texas A&M...so glad our Quarterback is a leader on and off the field, take notes AJ...Taj is the real deal! Go Tigers!!! Alabama vs. Texas A&M, hoping for an Alabama loss to move us up! Redecorating my house for fall! I'm sure my hubby will make sure we watch as many as possible, but I will be pulling for whoever's playing South Carolina! I'm going to use the bye week to try out some new tailgait recipes. Go Tigers! Alabama vs Texas A&M...huge SEC game that'll make things interesting early on in the SEC West! I'll be traveling this weekend but will definitely try and watch some of the alabama game and definitely will want to see how USC is holding up after their big loss!! I will watch the South Carolina game and be cheering for whoever they are playing!! All ACC teams and SEC teams! All ACC & SEC teams!!! I'll watch most any game on, but Carolina for sure. Following USC....to pray they loose. GO TIGERS! I love this tank! So cute for tailgating while it's still hot here in SC! We'll probably have ESPN on in the background all day, then sit down to watch the Carolina Vanderbilt game after the kids are in bed. Would love to watch it wearing this cute tank! USC, but just to see the score of course. I will be watching all of the games that are on while trying to get some housework done! Probably won't catch them all, but I will be watching to see how the Vandy/gamecock game goes! Penn State vs. Central Florida..... between our marriage vows and photos of course!! I will be watching ESPN all day! There is no telling what I'll end up watching- it's fun to have options! I'll be watching USC and Bama vs TAMU! I'll probably watch the Alabama/Texas A&M game and secretly hope for a 0-0 tie in triple overtime LOL. I was looking for a top to wear with my orange pedal pushers! THIS IS PERFECT! :)Thanks Clemson Girl and Queen of the Tailgate!